In the U.S., Peaches typically peak during late June through July in the South, and July and August in the North. In order to produce good local peaches, producers depend on ideal spring and early summer weather conditions, and no late frosts. If you want to know which are the best varieties of peaches for home canning, see this page! Always call before you go to the farm - Peaches are affected by weather (both rain and cooler temperature) more than most crops. And when they are in season, a large turnout can pick a field clean before noon, so CALL first! 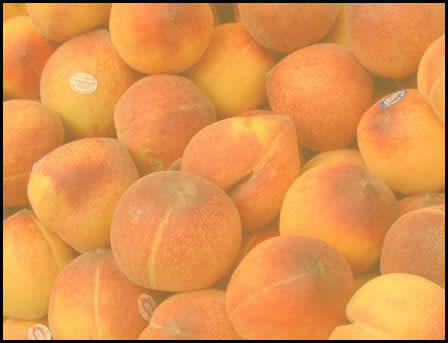 Most growers furnish picking containers designed for peaches, but they may charge you for them; be sure to call before you go to see if you need to bring containers. 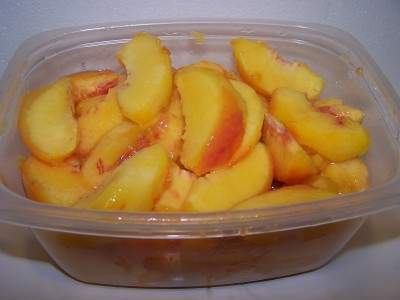 If you use your own containers, remember that heaping Peaches more than 14 inches deep will bruise the fruit on the bottom. Plastic dishpans, metal oven pans with 3 inch tall sides and large pots make good containers. You might want to ask whether the peaches are! 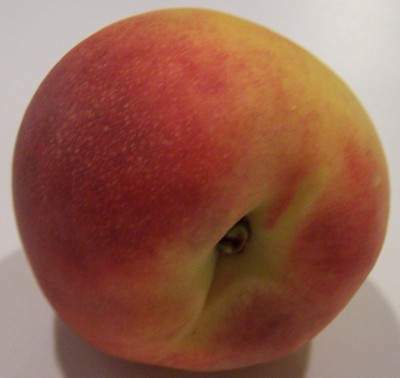 There are two major types of peaches: "Freestone" and. "Clingstone". Freestone peaches and nectarines have flesh that slips easily away from the pit. Clingstones are a REAL pain, because the fruit tenaciously clings to the stone or pit! Most peach varieties grown today are freestone and are usually available (depending upon your location) from June through September. Some nectarines are freestone and some are clingstone. Freestone nectarines are available in June and July. Most plum varieties are clingstone. Spread the fruit out on towels or newspapers and separate any mushy or damaged fruit to use immediately. Put a couple of days supply into the fridge, wash and cut the others and freeze them up! 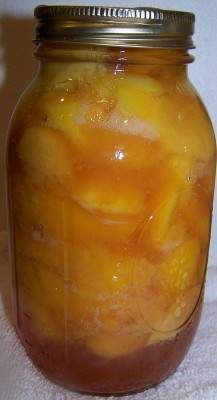 - how to make home canned peaches from fresh! - Or see here to freeze peaches instead! - or how about peach salsa? Here are some great and easy peach desert recipes, like easy peach cobbler. If you want more informat about the Giant Peach water tower in Gaffney, SC, click her. How to tell if the peaches are ripe! Color: Green is definitely unripe, but you can't use red color as an indicator of how ripe a peach is. Different peach varieties have differing amounts of red blush in their natural coloring. Pick them when the ground color changes from green to yellow, orange, red (or a combination). The skin of yellow-fleshed varieties ripens to an orange tint, while the skin of white-fleshed varieties changes from greenish- to yellow-white. Softness: unless you like your peaches very firm, pick your peaches with just a little "give" when gently pressed. Peaches at this stage are great for eating, freezing, and baking. Peaches won't ripen very much after picking! Odor: It should smell sweet and ripe! A peach is softer than most fruit, so it is important to pick a peach gently, with little pressure. Using the sides of your fingers rather your fingertips helps to avoid bruising. Grab the peach firmly and pull it straight off the branch. DON'T drop the peach into the basket, but set it in gently! Marks on the Peachs: Bugs (particularly squash bugs and stink bugs) bite fruit during development and this results in some imperfections in the peach. This is especially the case with organically raised fruit. These look like dents in the peaches if the peaches were bitten by a bug when they were young. This causes a spot that does not grow properly and makes a wrinkle in the peach. There's nothing wrong with these peaches. They may look funny, but they will taste just as good as blemish-free peaches, and it's better not to have the pesticides! About 2 medium peaches = 1 cup sliced peaches. About 4 medium peaches = 1 cup pureed peach. 1 lb of fresh peaches typically yields 3 cups of peeled, sliced peaches or 2 cups or puree. It takes about 5 good sizes peaches or nectarines (or about 10 plums) to fill one quart jar of canned peaches. An average of 11 pounds is needed per canner load of 9 pints. 1 bushel = 48 to 50 pounds, yields approximately 18 to 25 quart jars. And a visitor contributes this: 6-7 peaches makes about 4 cups puree, so 2-3 peaches make about 2 cups puree. 1 peach equals about 1 cup puree. It's best to remove peach pits before you cook the peaches. Cherry, peach, and apricot pits also contain amygdalin; the latter two, in potentially harmful amounts. Fortunately, peach and apricot pits are sufficiently large and hard that few people intentionally swallow or chew them. (The unapproved anti-cancer drug Laetrile is a semisynthetic derivative of amygdalin; a cheaper version of laetrile produced in Mexico came from crushed apricot pits.) See this page for more information. peaches are virtually fat free. A medium size peach contains less than one gram of fat. peaches are naturally sodium free. peaches are a low calorie snack. A medium size peach contains only 40 calories. peaches contain vitamin A which helps us see in dim light. peaches are considered a good source of fiber. The skin of a peach provides both roughage and fiber. Ripe peaches have a creamy or golden undertone and "peachy-sweet" fragrance. Peaches should be refrigerated and used within a few days. Putting peaches and nectarines in a loosely closed paper bag at room temperature for a day or two can help soften firm fruit - but they won't become sweeter or ripen further - that stopped when they were removed from th etree. For best flavor, allow the fruit to ripen fully on the tree. Store at 33°F to 40°F and high humidity (a vegetable drawer in the fridge). See my page on how to make home canned peaches from fresh! It is really SO easy! See my page on how to freeze peaches, plums, nectarines, figs and cherries. Even easier than canning and they will taste just like fresh.. but it does take up space in the freezer. Question: Which is better, to can or freeze peaches? Answer: In my experience, going back 50 years to my childhood, when my mother also canned and froze peaches, we both found that frozen were superior in color and flavor to canned peaches. It all depends upon whether you have room in your freezer. If you like apple butter and you like peaches, you'll LOVE this easy peach butter recipe, complete with canning instructions, so you can make them now and give them away at Christmas time! Peach jam - it is out of this world and SO easy. A traditional Southern favorite, canned spiced peaches! This recipe is easy and DELICIOUS!!! 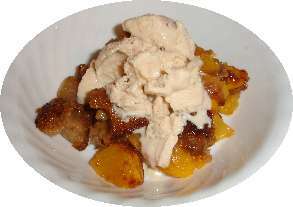 In most recipes, frozen or canned peaches can be substituted for fresh peaches. The frozen and canned peaches have already been sweetened; therefore, the amount of sugar called for in a recipe will have to be adjusted. Also, the peaches should usually be drained before using. How to plant a peach pit (also works with nectarines and apricots). If you save a peach pit you can grow your own fruit tree. Clean the pit and store it in the refrigerator in a plastic bag until September or October. Place the pit about five inches beneath the soil surface. In the spring, your tree will start to grow and should be visible by July! Keep the tree watered and fertilized (fruit tree spikes from Lowes, HomeDepot, etc.) and you'll have fruit in 2-3 years!